I bought this drone frankly because it looks so damn cool. The KF600 feels like a futuristic flying car and the optical flow camera underneath makes it fly very stable, as one should. The amazing part is that the drone is priced very low and comes with some interesting functions you can toy around with like had gestures. Allthough I only consider them gimmicks. The camera is pretty solid quality and can even be tilted slightly. I definitely recommend this as a low budget selfie drone and for playing around. When it comes to drones under $50 I don’t have the luxury to request any stability, but there are drones like this one that come with Optical flow technology. Battery life for toy camera drones should be at least 6 minutes per flight. Flight range can’t really be much bigger than 100m at this price. At this price, the standard is 720p camera. You should look for a sample video to check for colors, frame rate drops and if it has a micro sd card slot. The price is very important when judging any product, and this is no exception. I ill judge it considering it’s in the under $50 category and for that matter, it’s a pretty damn good buy. It unfortunately doesn’t come with a micro sd card slot, or else this could have been the complete package. The specs are what you’d expect, even even more. The camera is 720p as discussed previously, and the image is quite good for the size of this. It also actually can change the angle before flight, but only slightly, facing a bit down. The drone also can be controlled with a few gestures. Like raising your fist for starting the video or taking photos. These actually work, but I find it easier just to press the button. The transmitter is an obvious clone of the DJI mavic one, this time coming with fake antennas on top. But even so, it’s actually pretty good and quite small compared to others, and that’s always a good thing. All the buttons are clearly marked and everything works as intended. 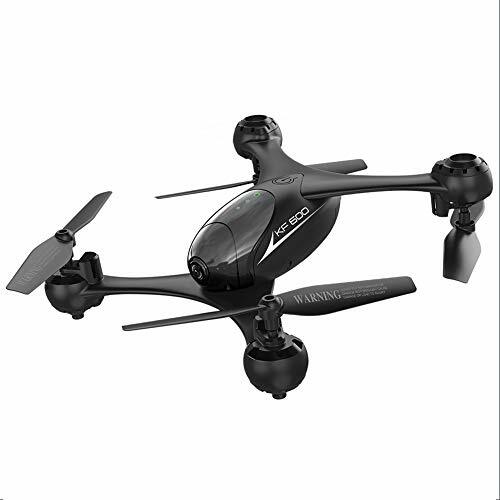 KF600 is a quadcopter that looks a lot like a flying car from the future but instead is a very cheap yet stable toy camera drone. I recommend it as a low budget selfie drone anytime.